Systolic and diastolic are two types of blood pressures in the arteries. The heart pumps blood to the aorta, which is the main artery in the body. A network of arteries transport blood throughout the body under pressure. Systolic pressure is the highest pressure in the arteries. Diastolic pressure is the least pressure in the arteries. 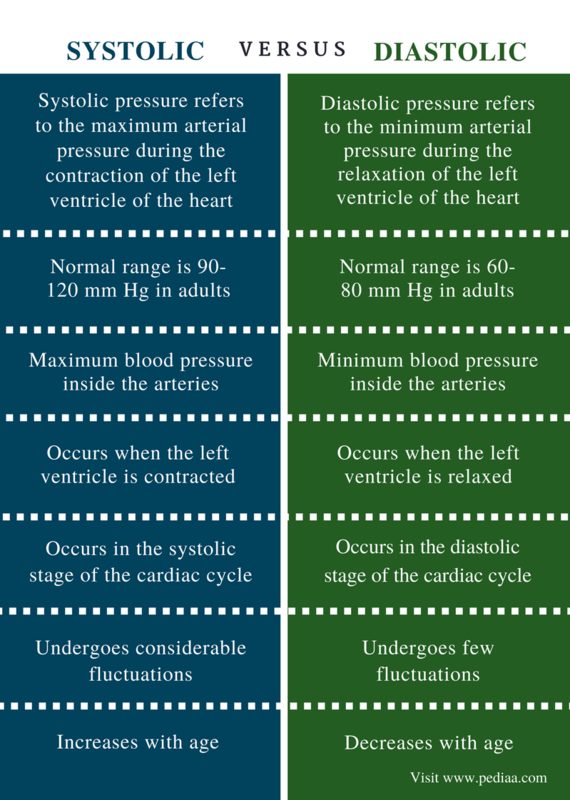 The main difference between systolic and diastolic is that systolic is the pressure generated by the heart while beating whereas diastolic pressure occurs between beats. The normal systolic and diastolic pressures are 120/80 mm Hg. The numerical difference between systolic and diastolic pressure is called the pulse pressure. The normal pulse pressure is 40 mm Hg. Systolic pressure refers to the maximum arterial pressure which occurs during the contraction of the left ventricle of the heart. The normal range of systolic pressure is 90-120 mm Hg in adults. Since the heart beats more strongly during exercising or in emotional stress, the systolic pressure also goes up. The systolic pressure in hypertension or high blood pressure is defined as 140 mm Hg. Systolic pressure occurs when the heart is actively beating. This phase is called the systole, which ejects blood out of the heart to the aorta. This ejection increases the blood pressure in the arteries. The pumping and the filling phases of the heart are shown in figure 1. Hypotension occurs when the systolic pressure is lower than the normal level. This cause dizziness, lightheadedness, syncope and organ failure. Low blood volumes may cause systolic hypotension. Diastolic pressure refers to the minimum arterial pressure which occurs during the relaxation of the left ventricle of the heart. This occurs between heartbeats. During diastole, blood fills into the heart. The normal diastolic pressure is 60-80 mm Hg. 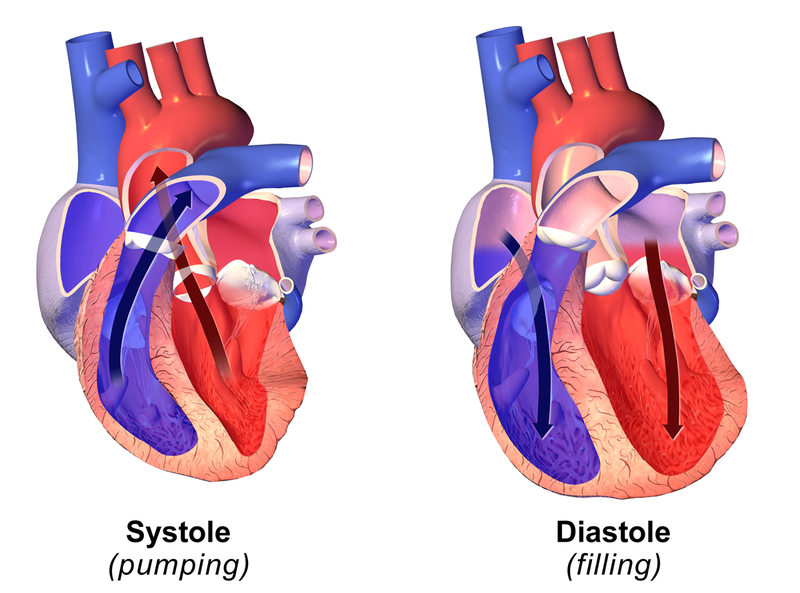 The blood pressure at both systole and diastole phases are shown in figure 2. In hypertension, diastolic pressure is also increased. During dehydration or following a bleeding episode, diastolic pressure may decrease, causing hypotension. Both systolic and diastolic are two blood pressures in the arteries. Both systolic and diastolic pressures are generated based on the heartbeat. Systolic: Systolic pressure refers to the maximum arterial pressure during the contraction of the left ventricle of the heart. Diastolic: Diastolic pressure refers to the minimum arterial pressure during the relaxation of the left ventricle of the heart. Systolic: The normal range of systolic pressure is 90-120 mm Hg in adults. Diastolic: The normal range of diastolic pressure is 60-80 mm HG in adults. Systolic: Systolic pressure is the maximum blood pressure inside the arteries. Diastolic: Diastolic pressure is the minimum blood pressure inside the arteries. Systolic: Systolic pressure occurs when the left ventricle is contracted. Diastolic: Diastolic pressure occurs when the left ventricle is relaxed. Systolic: Systolic pressure occurs in the systolic stage of the cardiac cycle. Diastolic: Diastolic pressure occurs in the diastolic stage of the cardiac cycle. Systolic: Systolic pressure undergoes considerable fluctuations. Diastolic: Diastolic pressure undergoes less fluctuations. Systolic: Systolic pressure increases with the patient’s age. Diastolic: Diastolic pressure decreases with age. Systolic and diastolic are two types of blood pressures in the arteries. Systolic pressure occurs when the left ventricle contracts to pump blood into the aorta. Diastolic pressure occurs when the heart fills with blood. Systolic pressure is the highest blood pressure inside the arteries, and diastolic pressure is the lowest blood pressure in the arteries. The main difference between systolic and diastolic pressure is the occurrence and the value of each type of blood pressures. 1. “Blood pressure chart.” Blood Pressure: Blood pressure chart, Available here.